It would be hard to find a more woebegone tunnel than the Wabash Tunnel. 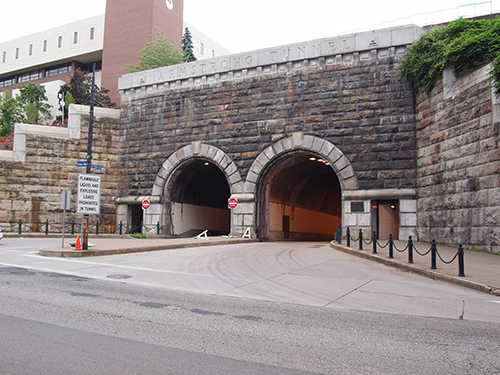 In 1903, the tunnel opened as part of the Wabash Pittsburgh Terminal Railway and was excavated through Mt. Washington to connect the railway to downtown. However, the railway went into bankruptcy four years later. Used sporadically the next few decades, the Wabash Tunnel suffered a landslide and fire, and in 1946 the tunnel was closed. In the 1970s, it was a part of the Port Authority’s ill-fated Skybus project. It was also included in the West Busway project, but that plan was soon nixed. Finally, this ugly duckling was opened in 2004 as a High Occupancy Vehicle accessway, where the tunnel and the ramp to it serve as a one-way road whose traffic flow is reversed to accommodate differing traffic flow patterns. 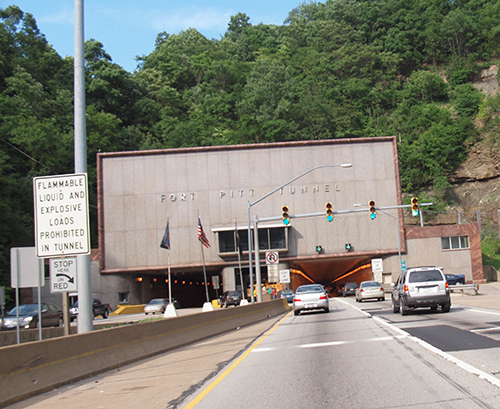 Tunnels are dark and confining, and don’t provide the views that bridges do, but nevertheless they are an integral part of our traffic system and are an essential element of what makes Pittsburgh so special.